During this 768-day reporting period, a total of 290 different nicks were represented on #LGBT. 1 kiwi_16 315 450 days ago "Â¤ No Flooding Â¤ No DoS attacks Â¤ No Spamming - â€‹ Â¤ No Cl..."
2 synapse 307 6 days ago "i did not realize she was "White Rose" until Season 2"
3 kiwi_91|tz 207 435 days ago "- \ \ / / | | | |"
4 eYe 79 47 days ago "Title: IRC4Fun Services Web Interface (at services.IRC4Fun.net)"
5 Amelody 64 2 days ago "I do still recommend watching Saga"
6 Lyra 62 112 days ago "saw something on r/showerthoughts earlier today actually"
7 lilwb 14 585 days ago "Dallas, so you were spared Harvey?" 8 siniTest2|tz 10 604 days ago "if irc.isChannel(channel) and channel in irc.state.channels:"
9 Testing|tz 10 603 days ago "##############################################################..."
10 kiwi_86 9 343 days ago "l0de test"
11 Fearful 9 269 days ago "Hey, I thought you guys might be interested in this blog by fr..."
12 fwilson 8 271 days ago "Hey, I thought you guys might be interested in this blog by fr..."
13 xrt/tz 8 659 days ago "ˆ“’‘LAME *UCKING NETWORK HERE"
14 synapse` 7 15 days ago "meh, i'll do it via msg :p"
15 UIN 7 71 days ago "<Testing/tz> #################################################..."
16 ppr/tz 6 669 days ago "( ,( )=m=D~~~ LOL DONGS"
17 luii|tz 6 612 days ago "torniggaiaoxhlcl.onion/6667"
18 monkeys|tz 6 609 days ago "ARE YOU TIRED OF PEOPLE WHO LOOK LIKE MONKEYS"
19 xunplini 5 271 days ago "Hey, I thought you guys might be interested in this blog by fr..."
20 Guest85805 5 731 days ago "http://creatvchaos.blogspot.com.eg/"
21 jor 5 261 days ago "Hey, I thought you guys might be interested in this blog by fr..."
22 garywhite 5 271 days ago "Hey, I thought you guys might be interested in this blog by fr..."
23 innovation 5 270 days ago "Hey, I thought you guys might be interested in this blog by fr..."
24 rtx/tz 5 666 days ago "CHECK OUT A NEW EXCITING TOR IRC"
25 KellerFuchs 5 271 days ago "Hey, I thought you guys might be interested in this blog by fr..."
Is kiwi_16 stupid or just asking too many questions? 21.0% lines contained a question! Lyra didn't know that much either. 9.7% of his/her lines were questions. The loudest one was synapse, who yelled 17.6% of the time! Another old yeller was Amelody, who shouted 3.1% of the time! It seems that kiwi_91|tz's shift-key is hanging: 4.8% of the time he/she wrote UPPERCASE. kiwi_16 just forgot to deactivate his/her Caps-Lock. He/She wrote UPPERCASE 2.9% of the time. Lyra isn't a sad person either, smiling 1.6% of the time. Lyra is also a sad person, crying 1.6% of the time. kiwi_16 wrote the longest lines, averaging 375.3 letters per line. #LGBT average was 138.7 letters per line. synapse wrote the shortest lines, averaging 47.4 characters per line. Lyra was tight-lipped, too, averaging 50.0 characters. kiwi_16 spoke a total of 18133 words! kiwi_16's faithful follower, synapse, didn't speak so much: 2785 words. siniTest|tz wrote an average of 95.00 words per line. Channel average was 21.82 words per line. tweet wasn't very popular, getting kicked 8 times! otaku seemed to be hated too: 8 kicks were received. 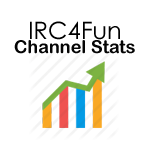 *.IRC4Fun.net is either insane or just a fair op, kicking a total of 145 people! *.IRC4Fun.net's faithful follower, X, kicked about 60 people. L was also very polite: 3 ops from him/her. X is the channel sheriff with 8 deops. synapse always lets us know what he/she's doing: 2 actions! kiwi_16 talks to him/herself a lot. He/She wrote over 5 lines in a row 18 times! Another lonely one was synapse, who managed to hit 7 times. v8 couldn't decide whether to stay or go. 498 joins during this reporting period! Lyra has quite a potty mouth. 0.5% words were foul language. synapse also makes sailors blush, 0.3% of the time. Total number of lines: 25887.